The Moche civilization developed along the arid coastal plain of northern Peru. Through a vast network of irrigation channels, this people maintained control of fresh water, a rare commodity. In the eighth century, a series of natural catastrophes led to the downfall of the Moche. A vivid record remains of their achievement, however, in their ceramic vessels, a preferred form being the stirrup-spout bottle shown here. The bases of these bottles were fashioned into portraits of nobles, commoners, warriors, gods, animals, and plants. This portrait vessel is painted with typical red, buff, and black colors. 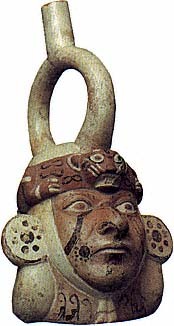 A simple headband, tied under the young man's chin, is decorated with the full body of a jaguar or puma.